Club Penguin Cheats by Mimo777 Club Penguin Cheats by Mimo777: Club Penguin Updates Homepage! Dood! 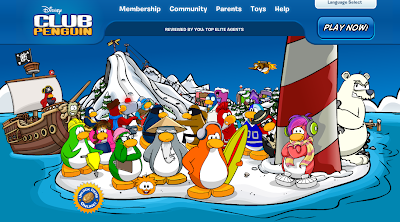 Have you seen this new Club Penguin homepage? This page is saweet! It shows just about everything in Club Penguin, don't you think? Notice how the buildings (Coffee Shop, Night Club etc.) are all still decorated for the Puffle Party? Why didn't I get credit? I told you 10 hours before you posted it. :o remember last time when the connection error! The director send out all the mascots names! This is it! theres a glitch with it! Like Jimbobson said, its dressed for the puffle party! Jimbobson, I just noticed that! Clubpenguin made a little mistake! Lol! Well, at least the puffle party decorations are cool! I noticed that too but they were not decorated for Puffle Party yesterday maybe they made a mistake? Hi I'm miamoo42 and i would luv to be a CPG Mod! Plz consider me! Ask me any question. I saw the exact same thing! I'm like: "Hmm. I should tell Mimo!" lol. I wonder why?? And also, Herbert never looks that big IN club penguin? He looks about Gary's height, but not on the homepage!! Mimo did you see that herbert is behinds the lighthouse with a wrench! Well Herbert would be that big, because polar bears are much larger than penguins. Anyway the new home page is great! About time they change it. NOOOOOO NOW THE HOME PAGE GOT WORSE!!!!!! IT'S RUINED, ALL RUINED! Please tell me it's only a temporary thing. I just saw today the puffle buildings.. i think you should post about it.